I can't keep flowers alive for love nor money. Many a weekend I'd treat myself to a bunch of flowers to decorate my home and within hours they're a wilting mess not to mention my floristry skills aren't the best. If you've read my previous posts (link) you'll know I'm lucky enough to have a fabulous florist who makes all their arrangements with faux flowers which even I'd be hard pushed to kill. 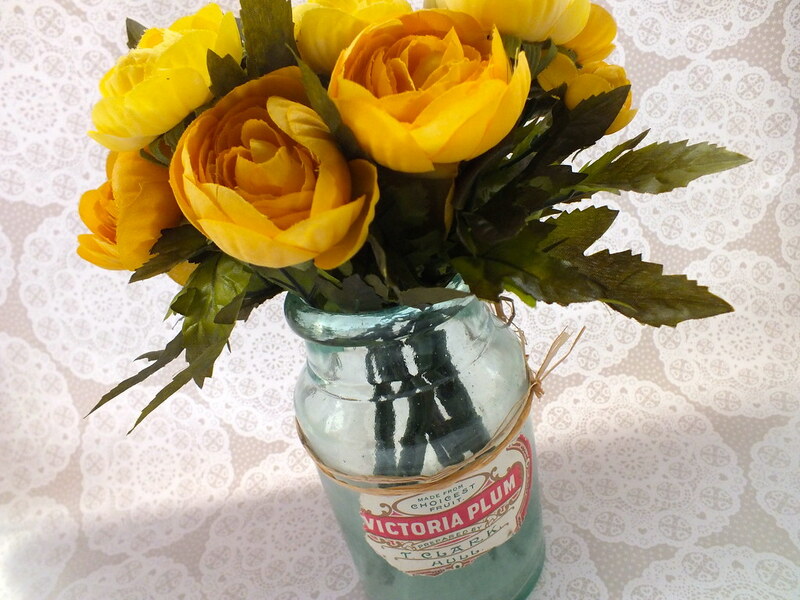 When I discovered this gorgeous vintage Victoria Plum jam jar on eBay I knew it was destined for some yellow roses which are my favourite and still look fabulous as we head into Autumn. Are you a faux flower fan or is that the ultimate faux pas in your book? very pretty, and I love the jar. I bought yellow, cream and orange roses yesterday. I buy fresh flowers each week. And during if I get the chance! Right now I have flower overload in the living room, but I'm not complaining! Lovely! I hope you have a great weekend! For display in the home, I prefer faux flowers because the won't wilt. I love real flowers in the garden though.